Luigi’s Ristorante Italiano has been a culinary mainstay in Downtown Galveston for almost 16 years. The Tuscan-style Italian restaurant, located in the heart of the Historic Strand District, offers homemade, authentic Italian fare. Everything at Luigi’s is made from scratch and prepared fresh. Luigi makes his pastas, breads, sausages and desserts in-house. At Luigi’s Ristorante Italiano, the service and cuisine are nothing short of exceptional. Luigi and Martha Ferre opened Luigi’s over 15 years ago when philanthropist George Mitchell offered the couple the opportunity to open a restaurant of their very own. Since that time, the Ferre’s have made gastric history. “It’s me in the kitchen, we don’t have a chef. As the owner, I care the most about service and quality,” says Luigi, “our restaurant is slightly more expensive but because we make everything from scratch, the quality makes up for the cost.” Everything from the pasta to the ice cream is made in-house and the few items that cannot be handmade, like meats and seafood, are bought fresh daily and served in the authentic Italian way from family recipes. 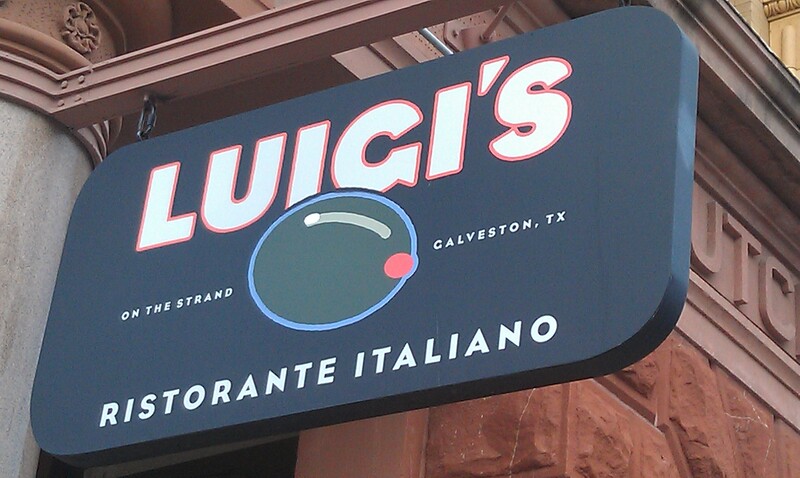 When asked about owning a business in Galveston, Luigi said “Sometimes it’s hard. In the summer, business is good. Winters are harder but, because we are family here, it works. I like downtown. I think Galveston is going to really grow with all the new attractions” like the newly opened Pirates! Legends of the Gulf Coast attraction in Downtown Galveston and the Historic Pleasure Pier that is due to open in the summer. Luigi’s Ristorante Italiano, a tenant of Mitchell Historic Properties, is located at 2328 Strand in historic downtown Galveston. Luigi’s offers daily lunch specials that vary from pasta to specialty pizzas and dinner specials that change weekly. Luigi’s is open for lunch Monday thru Saturday from 11:00 am to 2:30 pm, dinner Monday thru Thursday from 5:30 pm to 9:00 pm, and dinner Friday and Saturday from 5:30 pm to 10:00 pm. Luigi’s is closed on Sunday. Luigi’s Ristorante Italiano has been a culinary mainstay in Downtown Galveston for almost 16 years. The Tuscan-style Italian restaurant, located in the heart of the Historic Strand District, offers homemade, authentic Italian fare.